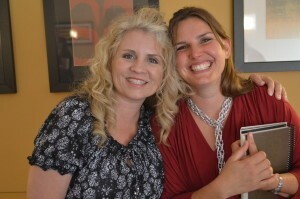 Classes are taught by Donna Ryan and Sarah Clark, morning-talk-show style; interesting, entertaining, and educational! They are as close to a live class, as possible, from the comfort of your living room. You will hear interviews from various professionals including a doula, chiropractor, lactation consultant, midwives, massage therapist, and personal trainer/health coach. With the unmedicated birth of her second baby in 1999, Donna was transformed! Giving birth naturally began a journey and desire to help other women have empowering births. Since 2003, she has had the honor of working with and teaching hundreds of couples through natural childbirth education classes. She has given birth to four beautiful babies in a variety of settings, with three types of care providers and in four different positions! Sarah has taught natural birth classes since 2008 and has had four natural births. A writer, Sarah is probably best known for her active work on her natural birth and mothering blog, Mama Birth. She has been published in several natural birth-related magazines and is a regular contributor on the Mothering Magazine blog. Donna and Sarah are available to answer your questions. The classes were created to be as close to a live class, as possible. If you do have a question that is not answered in the class and/or materials, please do not hesitate to email them. Our contact information is found on the website as well as business cards that will be included with your materials. The Birth Boot Camp team is here to support you on this amazing journey!